Homebush hauling its historic passenger train during the Ingham Maraka Festival on 21 October 2006. 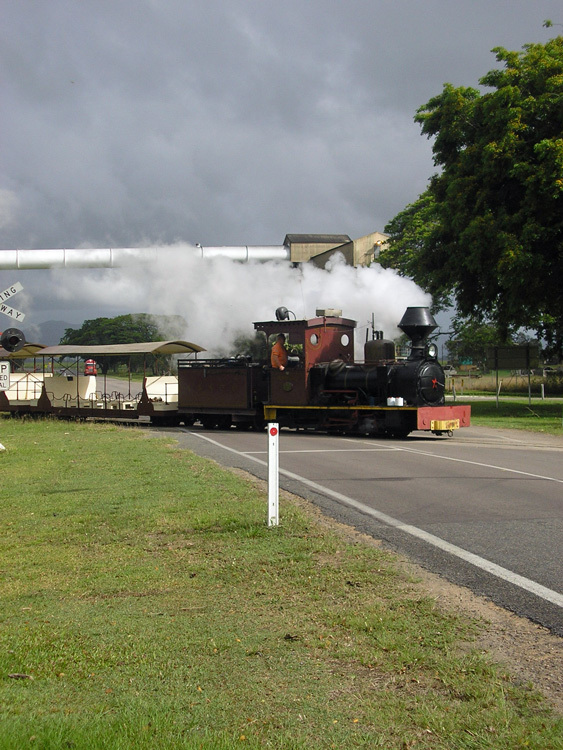 This scene is a reminder of the many road crossings made by mill tramways in sugar growing areas. This photo was kindly contributed by Brett Geraghty. 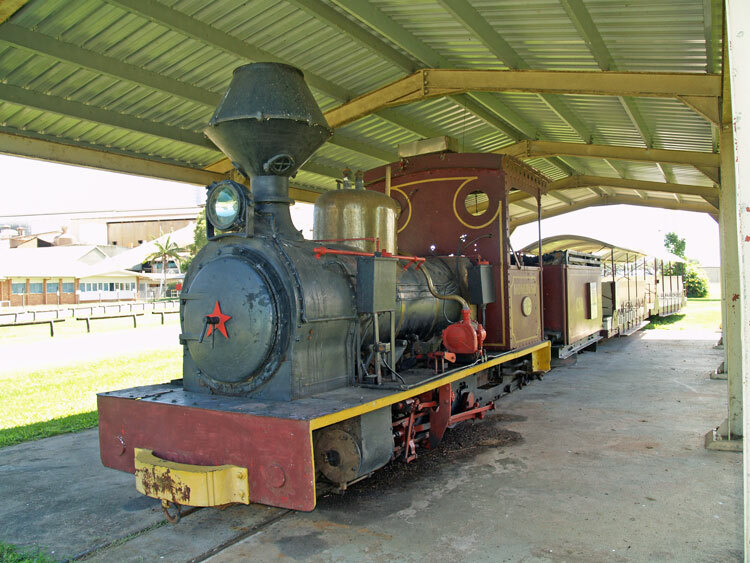 This locomotive was originally supplied to Homebush Mill, near Mackay, where it hauled cane from 1915 until that mill's closure in 1921. 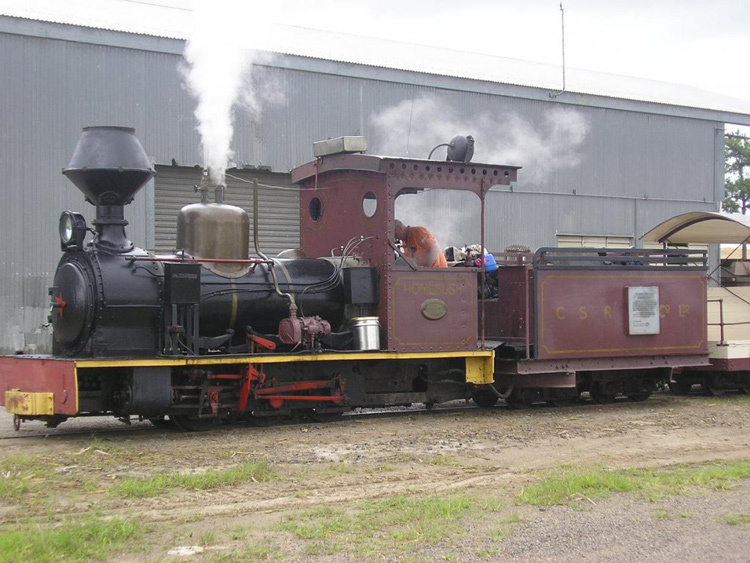 ‘Homebush’ was then transferred to Victorian Mill, Ingham and operated a passenger and freight service from the port at Lucinda to Ingham, Stone River and Long Pocket. The freight service was discontinued in 1932 but Homebush continued in cane and works train haulage for Victoria Mill until retired in 1976. Fortunately this locomotive was retained for preservation and restored to working order in 1978. 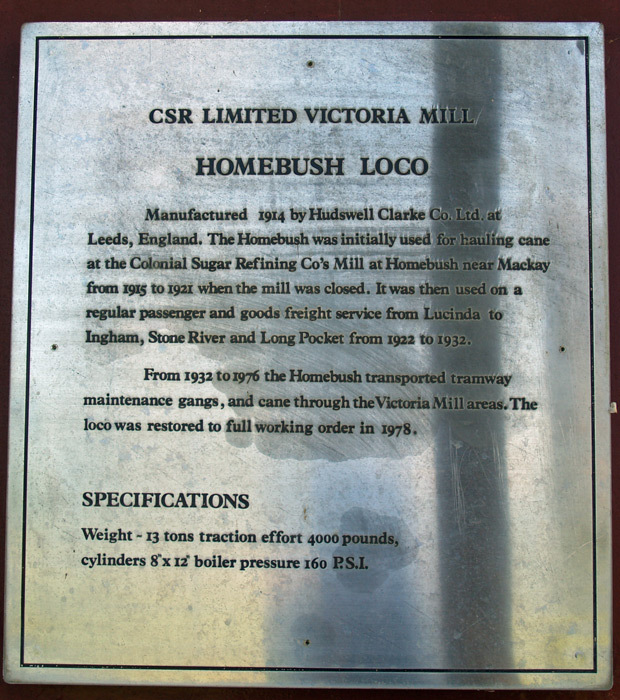 Homebush continues to be preserved operational at the Victoria Mill, Ingham, where it occasionally hauls a small tourist train around the mill railway system. Between steamings, Homebush and its train of two historic 1885-built toast-rack cars are displayed under a weather roof at the mill entrance. 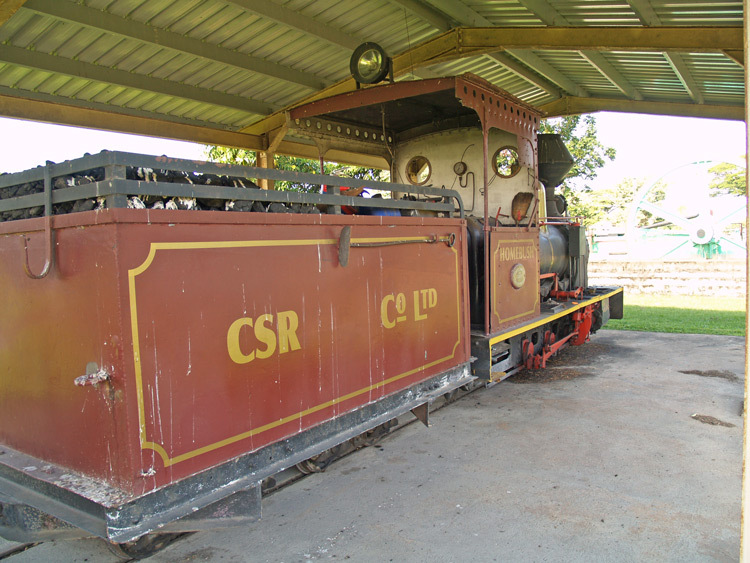 An excellent source of information on the various Hudswell Clarke steam locomotives employed by the Colonial Sugar Refining Co Ltd (CSR) in Australia and Fiji is ‘Salute to the Hudswells’ by Ian Stocks, David Mewes and John Browning. 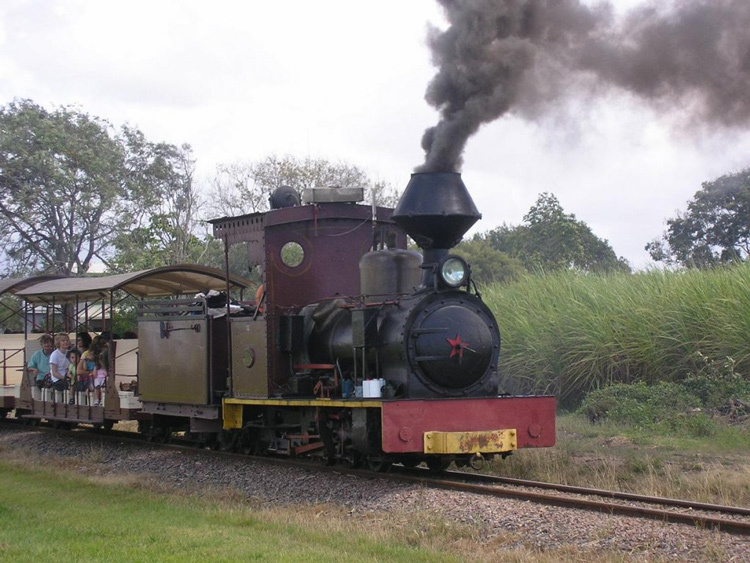 This book provides a good history and excellent historical photos for this locomotive, together with the various other Hudswell Clarke products supplied to the sugar mills in Queensland. Here is a second photo contributed by Brett Geraghty showing Homebush and its passenger train during the Ingham Maraka Festival of 21 October 2006. A third view by Brett Geraghty showing Homebush on 21 October 2006. Sitting on the running plate is a steam turbo-generator for supplying electricity to the front & rear headlights. 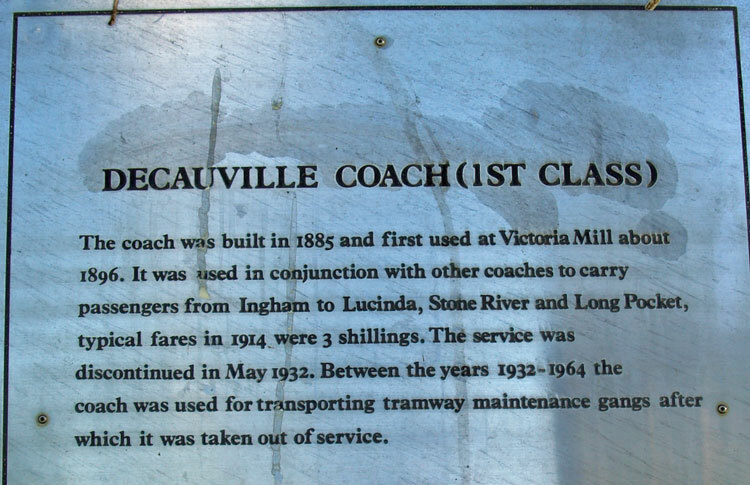 A large plaque which provides a summary of this locomotive's history can be seen attached to the tender side. 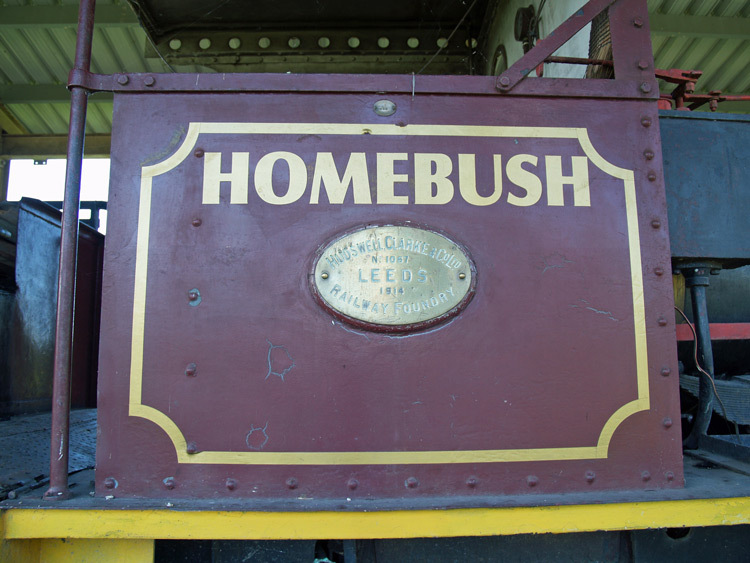 A view of the plaque attached to Homebush's tender. 21 April 2013. On 21 April 2013 I found Homebush resting in its usual home under a weather shelter outside Victoria Mill. A second view of Homebush resting at Victoria Mill on 21 April 2013. A large stationary engine & flywheel retired from the mill are also displayed in the background. Detail of the builder's plate attached to Homebush's cabside. 21 April 2013. This plaque is attached to one of the two toast-rack cars preserved with Homebush. 21 April 2013. (As per the photos above).